The Marathon des Sables (Marathon of the Sands) is a 6-stages/7-day foot race of aproximately 240km across the Moroccan Sahara desert. It is regarded as ‘The Toughest Foot Race On Earth’. Contestants must carry mandatory equipment, all food, clothing and sleeping gear in a backpack which weights between nine and twelve kilograms. Runners must prepare all their food throughout the race but the French organisers will supply a minimum of nine litres of water every day, and also a space on the desert ground of approximately one m width under a Berber tent for the night. Runners experience mid-day temperatures of up to 50°C, battle sandstorms and freezing nights, running and walking on uneven, rocky, stony ground as well as climbing 100m high sand dunes. 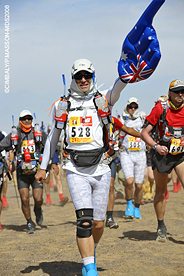 The Marathon des Sables was one of the greatest adventures of my life, and my journey of 245.3 kilometres across the Sahara desert finished after 37:41:00 – the winner did it in stellar 19:27:00! I was lucky to be able to take part in one of the most amazing adventure races. A race, in which the final time and position is secondary to the actual journey. The journey to get you to the start in the first place – and then that real journey of running, jogging and walking for seven days across the Sahara desert in Morocco. Enter your email address to follow this blog and you'll get any news straight to your inbox.